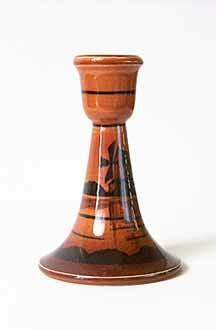 Brown Ault windmill candlestick - 5¾" (146 mm) high. William Ault set up his pottery in Swadlingcote, Staffordshire, in 1887 when he left Bretby at the age of forty-six. Ault was best known for his inventive use of coloured glazes. Christopher Dresser designed for him in the 1890s. In 1923 the firm merged with the Ashby Potters' Guild, and became known as Ault and Tuncliffe. The Ault and Tuncliffe mark was a fancy 'ATLTD' or the word 'Aultcliff'. The firm traded as Ault Potteries Ltd from 1937 until 1975.